It totally makes sense that aliens built the pyramids. Totally. Man I could eat a Toblerone. The card is left blank inside for your own comment and measures 12.8cm x 17.8cm. It comes with a brown envelope. Young Cartoonist of the Year 2013 Will McPhail has joined forces with Paperlink to produce a new series of greetings cards under the title ‘A Colourful Mind’. 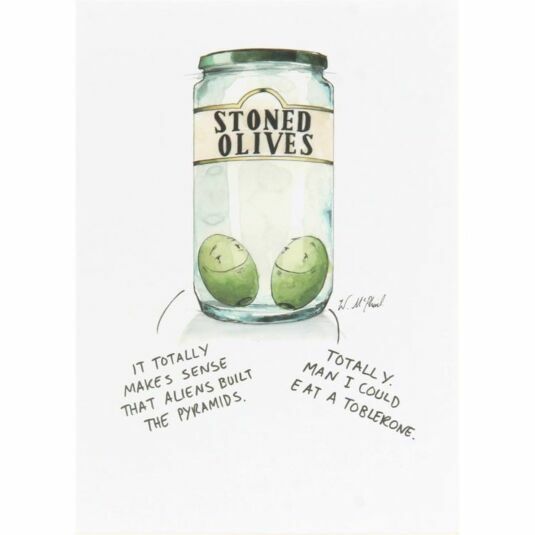 Will’s beautifully observed watercolour style combined with pithy observations of modern life make his cards an amusing and welcome addition to the Paperlink range.